November 14,1902 : A very rudimentary and makeshift recording studio had been set up in two large rooms of a hotel in Calcutta by the Gramophone Company. Frederick William Gaisberg and his assistants had arrived just three weeks before from England on their first Far East recording expedition for the Gramophone Company, which had been founded in England in 1898. They had appointed a local agent for selecting and training artists for recording on gramophone discs. However, the agent selected Anglo-Indian artists and completely ignored local talent. Gaisberg then sought the help of the local Police Superintendent, visited several theaters, attended mehfils at wealthy Jamindars’ palaces, and thus found at least one promising artist to begin with. The artist was a very famous dancing girl, and her voice was very sweet, although not for European ears. She agreed to a recording session for the handsome fee of 3,000 rupees. Such an artist was necessary in order to build a firm business foundation on the Indian scene, especially when several other German, French and American recording companies were also planning to capture the Asian market in general and the Indian market in particular. At around 9.00 a.m. a young lady entered the studio with all her paraphernalia, including accompanists and relatives. Loaded fully with very expensive ornaments and jewelry, this 30 year old, fair, medium-built lady went onto the stage prepared for the recordings. Sarangi, harmonium, and tabla players began to tune their instruments. Gaisberg personally checked the equipment. A thick wax master record was placed on the turntable rotating at 78 rpm. A huge recording horn was fitted on the wall behind her and close to her face, and she was asked to sing loudly into the horn. At the narrow end of the long horn a diaphragm fitted with a needle was connected to the recording machinery, with a needle placed on rotating disc for cutting the grooves. Gaisberg requested her to sing for three minutes and announce her name at the end of the recording. At the end of the trial recording she announced – ‘My name is Gauhar Jan‘. This announcement was necessary since the wax masters were sent to Hanover in Germany for pressing the records and the technicians would make proper labels and confirm the name by listening to these announcements at the end of the three minutes performance. Although sound recording was invented by Thomas Alva Edison in 1877, it took 20 years for the technology to mature, and after 25 years, in 1902, the first ever recording of Indian classical music was engraved in the grooves of a gramophone record. The song can be played even today in 2007 on a shellac record and Gauhar Jan will sing it faithfully for the music lovers and listeners as long as the technology to play back that singing exists. Who was this Gauhar Jan – the first dancing girl of Calcutta ? Born to Anglo-Indian parents, her name was Miss Angelina Yeoward. Her father, William Robert Yeoward, was an Armenian Jew working as an engineer in a factory producing dry ice at Azamgadh near Benares. He married a Jewish lady, Miss Victoria Hemming, around 1870, who was born and brought up in India and had learnt Indian dance and music. Angelina was born in 1873 and was baptized in the Methodist church in Azamgadh. This marriage did not last long due to Victoria’s love for dance and music and her relations with a Muslim friend named Khurshed. So after the divorce, she moved to Benares with Angelina and Khurshed, adopted Islam as her religion, and daughter and mother chose new names, Gauhar and Malka respectively. In those days, Benares was not only a sacred place, but also a seat of learning, a centre for all the performing arts, including dance, drama and music. She spent eight years learning the art to perfection and emerged as a well-trained Baiji, as she had decided to take up the profession of entertainer through dance and music. She became popular as Badi Malka Jan, badi (elder) because at that time three other Malka Jans were famous (viz. Malka Jan of Agra, Malka Jan of Mulk Pukhraj and Malka Jan of Chulbuli) and she was the eldest among them. Around 1883, the trio moved to Calcutta, a place of great patronage for music and the other arts. In those days, both Hindu and Muslims Baijis from Benares, Agra and Lucknow used to settle in the Bow Bazaar area. The place was famous for courtesans or Kothewalis who would entertain wealthy Jamindars and Babus with their art. Some Ustads would train this community after a proper gandabandhan. Nawab Wajid Ali Shah had settled at Matiaburj near Calcutta in his last days and his court was full of musicians and artists. In such an atmosphere Badi Malka Jan soon established herself, and within three years she purchased a building at 24 Chitpore Road for Rs. 40,000. Little Gauhar, too, was fond of dance and music and took her initial lessons from her mother. She had a sharp memory, intelligence and learned very quickly, and so Malka appointed special teachers for teaching Gauhar languages, literature, and of course, dance and music. 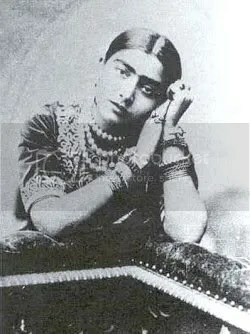 Kale Khan of Patiala, alias ‘Kalu Ustad’, and Ustad Vazir Khan of Rampur trained her in pure and light classical Hindustani vocal music, whereas Ali Baksh and Brindadin Maharaj taught her the Kathak form of dance. Srijanbai taught her dhrupad dhamar, and Charan Das trained her in Bengali Keertan. She also learnt from her contemporaries, viz. Mojuddin Khan, Bhaiyya Ganpatrao and Peara Saheb. She sang Tagore songs even before the word Rabindra-Sangeet had been coined. She penned several compositions under the name ‘Hamdam’, and she also wrote, composed and recorded ghazals. She could read, write and sing in several languages including Bengali, Hindustani, Gujrati, Tamil, Marathi, Arabic, Persian, Pushto, French, Peshawari and English. After such intensive training, she first performed at Darbhanga State at the age of fifteen, and from 1896 she began to perform in Calcutta. She used to sing and dance at the houses of rich jamindars and her remuneration was in thousands of rupees. She was in great demand and even ordinary citizens wanted to listen to her music. Gaisberg noticed this and made her music available to listeners through her gramophone records. Gauhar Jan recorded prolifically, a total of over 600 songs over the period from 1902 to 1920, and she sang in more than ten languages. From 1903, her records began to appear on the Indian market, and were always in great demand. Thousands of copies were imported after being pressed at Hanover, and they were best-sellers throughout India. In 1908, a record-pressing factory was built at Sealdah (close to the present Sealdah railway station), Gaisberg was invited for this occasion and recorded a few more songs of Gauhar Jan, for which the announcement of her name at the end was not required. The early records of Gauhar Jan are labeled ‘First dancing girl, Calcutta’. The word ‘first’ indicates her elevated position as the premier vocalist in the Calcutta’s musical world of 1890-1910. She cut records of raagdari sangeet, thumri, dadra, kajri, chaiti, bhajan, tarana and she popularized various types of ‘Kachha’ gana through her records. This was remarkable when several great stalwarts of Indian classical music ignored the gramophone and recording medium completely and refused to record. She mastered the technique of presenting a musical item in just three minutes, and this became a model for the vocalists of the future. She recorded the music taught by her Ustads, which meant that she helped preserve our musical tradition of at least the three-four generations preceding her own. Thus her recordings are very useful for students and also for researchers who might wish to trace the development of Indian classical music over the last two or three hundred years. One of her records was cut in 1907, performed at the Town Hall in Bombay, as mentioned on the record label. Through the wide circulation of her records, she became popular throughout India and received invitations in several prestigious music conferences. Thus in 1911, she was invited to participate in the Prayag Sangeet Samiti, for which she was paid 1000 rupees. Later, the same year, during the coronation of King George V at the Delhi Darbar, she was invited to sing a duet with Jankibai of Allahabad. They sang a Mujra song – Ye Hai Tajposhi Ka Jalsa, Mubarak Ho Mubarak Ho and received 100 gold guineas each as a gift from the King. Gauhar Jan used to travel all over India, as a guest of patrons in the various Princely states. She also gave public performances, in which she would present ticketed programs, distributing an advance schedule of the items to be sung in her concert. She was fond of horse-racing and hence would visit Bombay during the racing season. She used to stay with Anjanibai Malpekar, spending the day at the Mahalakshmi racecourse, and the evenings and nights at concerts. She was a great admirer of Heerabai and offered to adopt her when Abdul Karim Khan’s family separated and the mother moved to Pune with her five children. 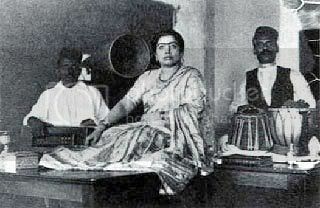 She taught a number of bhajans and thumris to both Heerabai and Sunderabai, which they in their turn duly recorded on gramophone records. Because of Gauhar Jan the songs Radhe Krishna Bol Mukhase and Kridhna Murari Binat Karat became popular bhajans and several singers used to sing them in concerts and on records. Gauhar Jan lived a very wealthy life, and she also donated generously to a number of causes. Numerous legends are associated with her. In Calcutta, she used to ride in a baggi driven by four horses, threw a party spending 20,000 rupees when her cat produced a litter of kittens, and donated only half the promised amount to Gandhiji’s ‘Swaraj fund’ when he did not keep the promise of attending the ‘fund raising’ concert and deputed a representative instead. In her personal life, she was deceived by her friends and relatives. She married her personal secretary – Saiyyad Gulam Abbas – a young man from Peshawar. He was ten years younger than her, and when she discovered his relations with other women, she was bitterly disappointed in him, and this led to several court cases and unpleasant incidents. Later, she stayed with Amrut Vagal Nayak in Bombay – a handsome actor on the Gujrati stage. This relation lasted for 3-4 years, and she learnt several songs composed by him including the famous Dadra, Aan Ban Jiyamen Lagi. The sudden death of Amrut Nayak was a big jolt that left her mentally disturbed. Relatives persuaded her to return to Calcutta. But she did not stay there long. The machinations of selfish and cunning relatives forced her to stay in Darbhanga State for a while. Finally she joined the service of the Mysore State, where she died in 1930. She has left over 150 records and most of them are in the safe custody of record collectors. The Gramophone company reissued 18 songs in 1994 on audio tape and CD under the banner of ‘Chairman’s Choice’, which no one (except perhaps the Chairman) noticed, due to lack of adequate publicity. It is necessary to preserve the legacy of Gauhar Jan in a more full-scale way for posterity, and some die-hard collectors and music lovers have committed themselves to accomplishing this task. brilliant! thanks for sharing. The story was fascinating, and the recording was a treat! Excellent piece. Very interesting and informative. The recording at the end is of 1902 and perhaps the first gramaphone record in India. Thanks for the awesome work that you are doing. I am also a collector of vintage Hindustani music and have some rare recordings. May I know where you live so we can get in touch ? I have simply no words how best I can appreciate your work. Even if some words are available they may not match your work. Just I can better reciprocate my appreciation by showering blessings on you. I used to collect old recordings when I lived in Kolkata fifty years ago. I have several recordings of D.L. Roy and Atul Prasad Sen singing their own songs. I also had several large and heavy one sided 78 RPM recordings of Peera Shaheb, Janki Bai, and Gauhar Jan singing. I nevers found any Songs written by Rabindranath, D.L. Roy, Rajanikanta, or Atul Prasad sung by any one of these singers. My oldest Rabindrasangeet singers were Satyabhusan Gupta, Amala Das, Balaidas Seal, Purna Kumari Dasi, Manada Sundari Dasi, and Radhika Prasad Goswami (besides Rabindranath himself). If for nothing else, for sheer historical importance, I would be interesrted (so wouldbe Shantiniketan and many others) if you would share any of Gauharjan’s Rabindrasangeet recording. I will share with you many rare Rabindrasangeet and others. Thanks. Thanks for visiting Dr. Ajit ji. I tried to find recordings of Gauhar Jan singing Rabindrasangeet but unfortunately I couldn’t find any in my collection. Great job! Thanks a ton for the great recording. Is it possible to get an audio CD original of ‘Chairman’s Choice’ containing Gauhar Jaan’s songs? If not can anyone help me obtain these or allow me to download them,if it is not an infringement of any law. I shall be grateful for a reply.